There are some movies you go into with little expectations and The Greatest Showman exceeded mine and then some. From the trailer it appeared a typical Make you Feel Good with the Family Holiday Flick. It still served that purpose, but with how memorable the songs were, colorful sets, and powerful the emotions, it quickly moved into my Top 5 Movies of 2017. From the opening scene, I knew this movie was going to be different. The story of P.T. Barnum is a controversial one and I was curious to see how they’d spin his celebrations of hoaxes and capitalizing on “freaks” into something positive. The Greatest Showman displayed the Found Family Trope, which made P.T. endearing, despite his inner conflicts and the tension between his family. I appreciated that none of that was written off and was alluded that he was a troubled person through the end credits. I’ve known Hugh Jackman was a singer through Happy Feet, his performance at the Oscars years ago, and the internet gifting me the knowledge of his Broadway Career – Small snippets. The Greatest Showman was the perfect way to convince me and audiences alike of his vocal caliber. Zac Efron’s vocal range has changed! I hadn’t realized it’d been ten years since Hairspray, but wow his voice has matured. He and Jackman’s scene at the bar was easily my favorite. That choreography was only between two people, but I was mesmerized by it and I can still picture it as I listen to the soundtrack on repeat. Zendaya comes from the Disney Channel Star Turned Singer Route and is of the successful ones that have made a career of herself. Spider-man: Homecoming was her movie debut as the new MJ and I absolutely loved her, and her role in The Greatest Showman will definitely take her far. I also can’t help but wonder if she had to contain fangirl squeals being the love interest of co-star Zac Efron! Keala Settle makes her theatrical debut from Broadway as The Bearded Lady. Powerful voice and performance, I’m so pleased to see her lead song “This is Me” up for a Golden Globe. I thoroughly enjoyed her character. Pasek and Paul provide the musical number pieces. You might know them from last year’s musical film La La Land, or the musical episode of CW’s The Flash. They’ll also be the team behind Disney’s up and coming live action adaption of Aladdin. The quality of the compositions is something you see from Disney, so I’m very excited to see how they handle such a beloved classic. The music truly sticks with you as you leave the theater. Lively openings, powerful anthems, and heartfelt ballads. 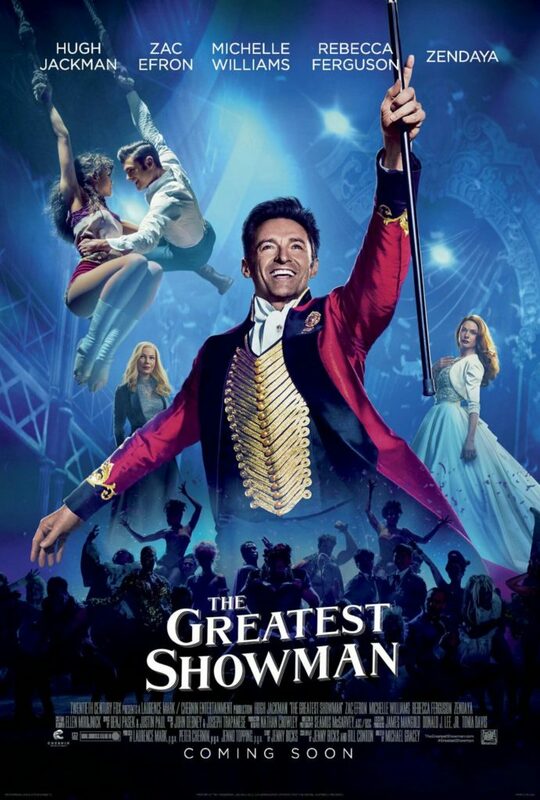 Between the lyrical songs and John Debney and Joseph Trapenese’s score, The Greatest Showman is an instant classic to your music collection. Go see this movie. PG never negates the quality of a film. They are just as important stories to be told without the reasons movies become PG-13 or R. It’s not a perfect film, but it’s a piece of entertainment history that anyone with a love of show business will appreciate.